A new report has ranked Peterborough as one of the biggest jobs creating cities over the last century. The city has been ranked second out of the UK’s 64 largest cities that have more than doubled their employment over the past century. The report, called A Century of Cities, has been drawn up by the research group CentreforCities. It states: “All in all, 22 of the UK’s 64 largest cities have more than doubled their employment over the past century. “Peterborough, Oxford, Cambridge and Reading are among those that have grown most strongly, with Crawley - in number one position - now boasting more than 600 per cent more jobs than in 1911. The reports states that in 1911 the total number of jobs in Peterborough was 21,278 but just over 100 years later it had risen to 100,714. Centre for Cities’ acting chief executive Andrew Carter said: ““A Century of Cities offers a unique opportunity to make sense of the long-term factors behind the two-tier urban economy of progress and decline that we see in Britain today. “We must take heed of the lessons of the past when planning for the future. The diversity and depth of the city’s industries have ensured our economic growth is sustainable. Steve Bowyer, acting chief executive of economic development company Opportunity Peterborough, said: “We know Peterborough’s economy has performed well across a number of indicators in recent years, but when looking at our achievements during the last century, this new study highlights even greater strength in the city’s ability to create new jobs. “Crucially, the diversity and depth of the city’s industries have ensured our economic growth is sustainable. “Peterborough has five high performing business sectors ranging from advanced manufacturing and finance, to digital and creative industries and environmental services. “The city is home to companies with worldwide impact - The BGL Group, Thomas Cook and Caterpillar Perkins for example - as well as smaller businesses that are pushing the boundaries of technology, innovation and sustainable ways of working. “It’s this vital mix of scale and variety of commercial operation that ensures the continued growth of Peterborough’s economy. 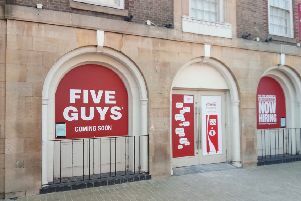 He added: “As a medieval city Peterborough has a rich heritage, but we also have a history of successful physical growth born from our new town status during the 1960s and 1980s. We’re an ambitious city with bold plans to deliver further regeneration and economic growth; our £3 million Future City Demonstrator programme is one area of work that is already driving innovation, enhancing our circular economy and boosting local skills. “In addition to the great work of Peterborough DNA, our pioneering Skills Service is working with local schools and employers to upskill the city’s young people to make sure they have the necessary skills businesses need, when they need them. This, and the continued growth and development of our local companies, is helping to reduce the city’s claimant count which is reducing 50% faster than the national average over the last year. Peterborough MP Stewart Jackson said: “It’s great jobs news. “We want to see more businesses and high skilled work as well as decent wages and more apprenticeships.